This week I had to play with some TFT screen for RapberryPi for making a prototype for a local company. You can find many TFT screen on Internet but most of them are not coming with a nice fresh documentation for being use and it is kickly a mess to get it start with them. I ordered different one having the same 3.2” size matching my need and got 2 of them for starting tests. This post details how to use a such screen for displaying a picture on it from a console line. Announced in 2015 and mostly delivered in 2016, the 9$+ computers are now a reality. The first one to be delivered was Domino.io with a price of 14$ it is actually the most expensive device but also one with a nice list of addon. The kickstarter campain was a success even if it raised only 46K$. CHIP was in the same period of time a great success with 2M$ raised on Kickstarter for 50K requested. And actually it still incredible to me to reach a such cheap price for a device with a such complexity. Last but not least, the famous RaspberryPI zero is just starting to be distributed at the incredible price of $5 and is actually impossible to obtained under $20 on ebay auctions. As a owner of these 3 different platform, I will publish in this post the difference we have between them and what we can expect from them. You may have read some of my post about RF433 and Raspberry PI. Basically with RPI 1, I was using wiringPi interrupt handler to manage the RF433 decoding. The problem is that with RPI2 and RPI B+ the delay to take an interrupt that was becomes unpredictable. And the timing constraints are not respected. As a consequence part of the messages are loss because for these delay. One of the solution (the software one) is to be more efficient to proceed the interrupts and the way to do this is to compile a kernel driver for directly handling the interrupts. This is what this post is about. This comes to complete the RFRPI code and associated hardware. A complete source code and software for using it is on the rfrpi bitbucket repository. Challenge of the coming days : write a kernel driver to manage interruption quicker on a raspberry pi 2. I’m happy to find a lot of example on Internet and in particular this one, that is really looking like what I’m trying to do. This post is describing all the step needed to do this. Yesterday I made a conferences about Internet Of Things main technologies with live demonstration. Watch it on Youtube ! 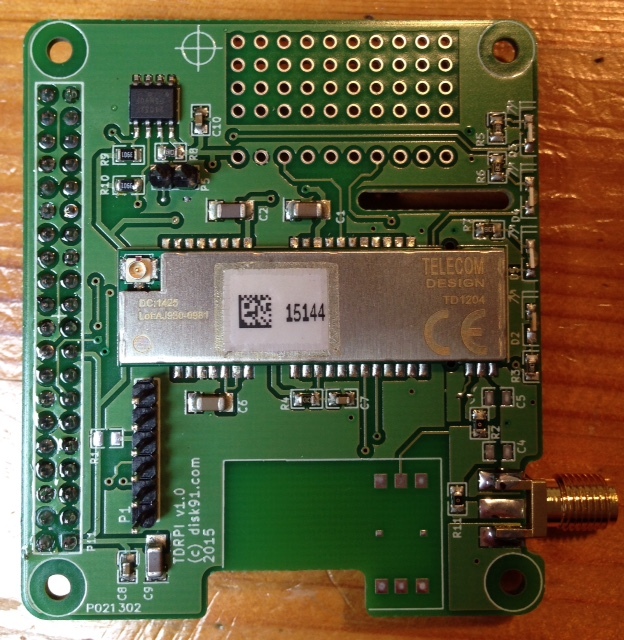 The SigRPI shield is a HAT standard board providing SigFox connectivity to your Raspberry PI. As it is not certified for this network it can’t be used in production for this usage, but you can use it as a long range RF that does not need certification. I will later details this with a project related to this function. By-the-way, the purpose of this board is to let you play easily with sigfox. The raspberry-pi offering a really efficient way to code and to make prototypes. The shield comes with TD1204 (including accelerometer & GPS) of TD1208 (sigfox modem). You can use it with the standard firmware or upload your own one. This posts details how to setup it and use it. In a previous post I explained why the IoT is appearing in this period thanks to the network technology evolution. It would not be a complete analysis if I would not care about the social evolution. In parallel of IoT and technologies there are other rising trends : Makers, Fablabs, embedded systems, 3d printing and crowd-founding. Take a look at personal computing some decades ago when guys like Jobs or Gates make the first line of code and solder the first micro-processors in their garage ; they just used the technological elements available that time and were able to make them doing much more than what they have been made for. They did it because they were able to do it. The same story appends in the late 90’s with Internet : anyone was able to code some PHP stuff and create a service in his garage thanks to this students have created Facebook and many more. At the opposite, when smart phone appeared in the middle of the 90’s it was a technology that requires strong industrial assets and this technology has been limited to major companies. The smart-phone revolution had been the same opening door to programmer to an new area with applications (apps). In fact all previous hardware evolutions since the Personal Computer beginning was requiring huge technological assets to be part of it. IoT disruption is breaking these last 40 years where only software were hackable by getting hardware accessible. When you want to design a shield for Raspberry Pi, you have to follow the HAT standard. This standards describes the form factor of the shield to ensure future compatibility. It also describes the configuration solution for the board based on a flash containing necessary information. The Hat standard link gives all the detailed specification to design a such shield. In this post I’ll describe my experience of designing such shield and you will find the basic elements I build and now sharing with you. The new version of kernel now activate the device-tree standard, it means that instead of having all module activated by default with some stopped by a blacklist system, now, all are disable and activated only when described in a device tree. Device tree details the system architecture and dependencies following configuration files. The device tree can be owned by the shield itself in an attached eprom.